Denes Wholegrain is a wholesome, nutritionally balanced food available as a mixer. The Wholegrain range is high in fibre and contains additional vitamins, minerals and trace elements to nourish and protect your dog from the inside out. With natural wholegrains, flour and grassmeal for healthy digestion and internal systems, ensuring your dog is maintained in peak condition for a happy and healthy life. Cereals (Wholegrain Wheat), Derivatives of vegetable origin (herbs include Seaweed), Grassmeal, Minerals. Protein 11%, Oil 2%, Ash 7.5%, Fibre 4%, Calcium 1.4%, Copper (Cupric Sulphate) 15mg/kg, Vitamin A 5,000iu/kg, Vitamin D3 500iu/kg, Vitamin E 50mg/kg. 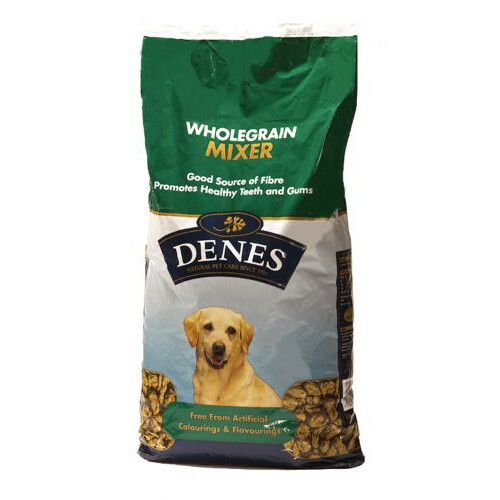 There are currently no questions for Denes Wholegrain Mixer Dog Food - be the first to ask one!